Ughh just when you like something that's PERFECT for your skin . Well it's to bad this product is being discontinued soon :( Hopefully cowgirl dirt will bring this Concealer BACK someday.!!! I cannot rave enough about this concealer! I ordered a sample of it, and absolutely loved it, so I ordered the full size. It smells amazing, and it covers extremely well. I think it does better than my Covergirl cover stick, and it takes the red out of blemishes very nicely. Excellent product! I ordered the Neutral Light and it is the perfect color for me. I have very light skin with pink undertones. Highly recommend this! The light was too light and the medium was too dark. Would love it if the shade worked well. I am N2/N3 for shade for reference. I love this concealer and the smell of it. I sampled the warm ~light. A shade darker would be Perfect .I'm light skinned to medium . So I ordered a full product. ;o). Go's on smoothly .A little more moist this product would be fantastic . Ty For sharing this amazing dirt. Love this concealer - the neutral light is just perfect for my pale skin. It does crease just slightly if you put it on a little thick though. This concealer is AMAZING! It gave me amazing coverage over my pimples and dark under eye circles, it smells so good and is not sticky but the perfect consistency! Would recommend for anyone! This Concealer isn't my favorite Cowgirl Dirt product but it is pretty good. It goes on smoothly and covers pimples pretty well. My undereye veins are very visible and this concealer doesn't completely cover those but the Southern Belle foundation does. Overall, I'm pretty happy with this concealer. Cowgirl Dirt’s Concealer is great for more than just covering pesky blemishes, its amazing ingredients help heal your skin! Carrot Seed Oil: Full of antioxidant rich vitamin A, these carotene oils regenerate and nourish your skin. Phytolipid Complex: This combination of Jojoba, Neem, Rosehip and Vitamin E Oils bring multiple advantages. They moisturize, rejuvenate, and nourish your skin while providing it with key antioxidants and anti-viral components to help heal your skin. Eyebright Extract: This anti-inflammatory astringent works to reduce redness, swelling, and irritation. Zinc Oxide: This natural UVA and UVB protection helps keep your skin healthy and protects you against damages from free radicals, all while aiding in the reduction of skin irritation. Certified Organic Non-GMO Caprylic/Capric Triglyceride (coconut oil extract), Zinc Oxide, Certified Organic Beeswax, Certified Organic Simmondsia Chinensis (Jojoba) Seed Oil, Silica, Certified Organic Rosa Canina Fruit Oil, Non-GMO Radish Root Ferment Filtrate, Certified Organic Azadirachta indica (Neem) Oil, Certified Organic Olea Europaea (Olive) Oil, Certified Organic Camellia Sinensis (Green Tea) Leaf Extract ,Certified Organic Euphrasia Officinalis (Eyebright) Extract, Certified Organic Daucus Carota Sativa (Carrot) Seed) Oil, Non-GMO Natural Vitamin E Oil (+/- Iron Ox, Mica, Organic Oil Blend). 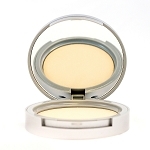 Cowgirl Dirt Concealer has a creamy texture makes application a breeze. Start by using Cowgirl Dirt’s Concealer Brush and lightly coating it with Concealer. Gently cover any problem spots or blemishes in a swirling, dabbing fashion. For best results, do not smear. Dab the concealer on and blend in with the Foundation Sponge . Once the concealer has been applied in all the desired places, even out your overall skin tone by applying a coat of foundation (cream, pressed, or powder) over your face. If you find that the concealer is going on too thick, try lightly wetting the Concealer Brush before applying concealer to it. Cowgirl Dirt Concealer comes in two shade families, warm and neutral. The warm shades are formulated with with yellow and orange undertones perfect for those with natural warm yellow pigments in their complexion. The neutral shades are formulated with pink and yellow undertones which are perfect for complexions that have more pink or both undertones. The pigment of the shades are light, medium, and dark. Choose the shade that will most likely match your skin tone. 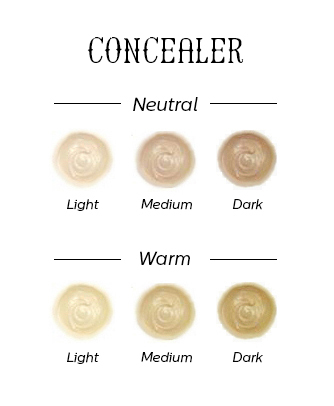 If none of the colors perfectly match your skin color, it is best to use a shade lighter concealer. Since the concealer is being applied under the layer of foundation you will still have seamless coverage with the added benefit of adding subtle highlights to your face. Q: What if there isn't a concealer that is exactly the same as my skin tone? A: If none of the colors perfectly match your skin color, it is best to use a shade lighter concealer. Since the concealer is being applied under the layer of foundation you will still have seamless coverage with the added benefit of adding subtle highlights to your face.